Earth Day was first celebrated on April 22, 1970 with the help of 20 million Americans. Today, more than 1 billion people across the globe unite to celebrate this “green” day and work to reduce their carbon footprints. We make decisions for ourselves every day that affect our environment, but what about our dogs? What choices do we make for them that have a lasting impact on the Earth? Following are some simple suggestions on ways to celebrate Earth Day with your pup and reduce their carbon pawprint. Go for a walk right from your front door. People often drive to a park or trail to take their dog for a walk. These are great activities, but skipping the car ride even one day each week will make a difference to the air. Walking around your neighborhood is a great way to meet people, connect with your neighbors, and discover things you never knew existed right around the corner from you! Buy “green” items for your dog. Every dog parent knows how many things you purchase for them each year. Leashes, toys, bedding, bowls, cleaners, etc. Many companies manufacture these items using recycled materials and renewable energy. You can even find eco-friendly clothes for you precious pup! Everyone looks stylish when they’re saving the planet. Visit one of our favorite places, Leash on Life http://www.leashonlife.net/, to start shopping! Spring into Clean and donate! Spring cleaning often involves closets, messy corners, and garages, but what about cleaning out the dog’s stuff? Families often have extra blankets and toys no longer wanted. You can donate gently used items to your local animal center or search your community for organizations that provide pet items to lower income families. Newspapers are also valuable to animal centers. See the Iowa City Animal Care & Adoption Center’s wish list at http://icanimalcenter.org/pages/support-us/donation-wishlist.php. Pick up poop with biodegradable poop waste bags. Every person lucky enough to share their life with a dog is well versed in picking up their dog’s poop. One simple step families can take in honor of Earth Day is switching from plastic bags to biodegradable poop waste bags. Two popular brands are Bio Bag http://biobagusa.com/biobag_dog.htm#dog and Poop Bags http://www.poopbags.com/product-category/poop-bags/. Plant a tree. Many parks have programs allowing you to sponsor trees being planted and you can often have them planted in honor of someone special to you. What dog wouldn’t love a tree named for them? Trees are also wonderful additions to yards at home, but you need to make sure you won’t disturb any utility lines by digging. Before planting trees in your yard, go to http://www.iowaonecall.com/. These are only a few of the possibilities out there for you and your dog. Do you already have an Earth Day tradition? Leave a comment below to share your activity with others. 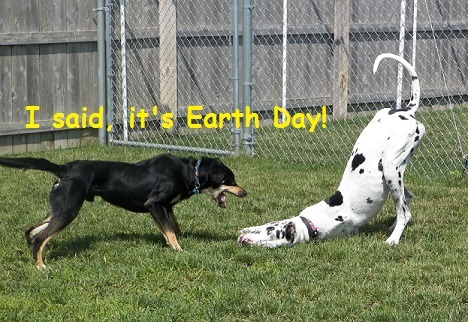 However you and your dog spend today, have a wonderful time and enjoy Mother Nature! My pup helped me celebrate Earth Day by keeping me company while I potted plants. When I couldn’t decide what plants looked good together, he helped me choose! When cooking last night I was very happy to be able to pick fresh herbs out of my back yard rather than making a special trip to the store! And my pup sure enjoyed the time outside!